Predicting Success is a practical guide to finding the perfect member for your team. By applying the principles and tools of human analytics to the workplace, you'll avoid bad culture fits, mismatched skillsets, entitled workers, and other hiring missteps that drain the team of productivity and morale. This book provides guidance toward implementing tools like the Predictive Index®, behavior analytics, hiring assessments, and other practical resources to build your best team and achieve the best outcomes. Written by a human analytics specialist who applies these principles daily, this book is the manager's guide to aligning people with business strategy to find the exact person your team is missing. An avalanche of research describes an evolving business landscape that will soon be populated by workers in jobs that don't fit. This is bad news for both the workers and the companies, as bad hires affect outcomes on the individual and organizational level, and can potentially hinder progress long after the situation has been rectified. Predicting Success is a guide to avoiding that by integrating analytical tools into the hiring process from the start. Analytics has proved to be integral in the finance, tech, marketing, and banking industries, but when applied to talent acquisition, it can build the team that takes the company to the next level. If the future will be full of unhappy workers in underperforming companies, getting out from under that weight ahead of time would confer a major advantage. 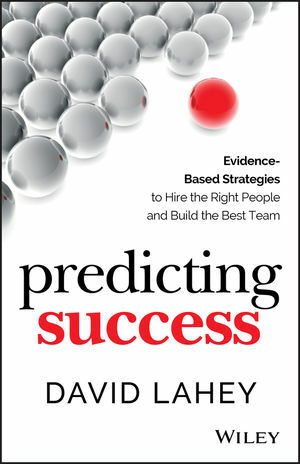 Predicting Success provides evidence-based strategies that help you find precisely the talent you need. DAVID LAHEY is the founder and CEO of Predictive Success, which helps firms align people with business strategy. In 2013, Predictive Success was awarded Profit Magazine's Profit 500 Award for the fastest-growing new companies.David's work has been featured in The Toronto Globe & Mail, Vancouver Provence, CBC Radio, Calgary Herald, Star Phoenix and Financial Post. He is also a frequently requested guest lecturer at top MBA programs.